The unique Roof Extenda Bracket ‘S Series’ is proudly Australian Designed and Australian Made. A better way when building Carports and Pergolas etc. Pergolas, Carports and similar structures are being erected all over Australia. Their popularity is increasing as they offer protection from weather and are valuable additions to homes countrywide. 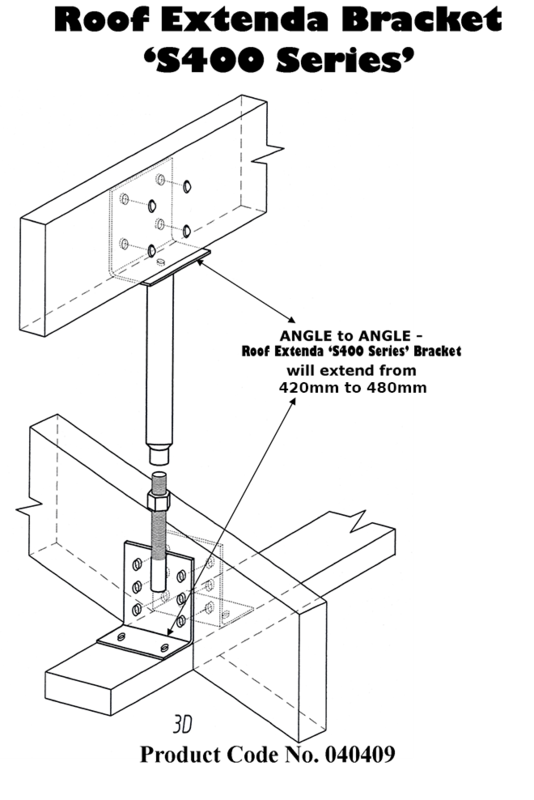 The Roof Extenda Bracket ‘S Series’ is designed to provide a better and safer means of attaching the beams for carports, pergolas, pool enclosures or any other roofing project that is to be added to the roofline. The Roof Extenda Bracket ‘S Series’ is attached to the rafter and the wall top plate therefore providing strength, safety and peace-of-mind. The Roof Extenda Bracket ‘S Series’ can add height clearance to carports allowing for adequate overhead room for high vehicles and equipment. Raising the pergola or carport roof above the existing fascia allows for free flow of air and a reduction in heat buildup, therefore providing the added benefit of greater ventilation making the area beneath cooler in summer. Cleaning gutters is also much easier and safer - the additional structure is above the gutter which allows easy access without having to get on a roof. The Roof Extenda Bracket ‘S Series’ is extremely successful in areas where high winds are experienced as it is fixed by hex bolts directly through the roof rafters and hex screws into the wall top plate giving a structurally sound fixing method. When attaching the adjustable Roof Extenda Bracket ‘S Series’ to the rafter and wall top plate the workload and time taken in completing a project is greatly reduced, as traditional means of fixing pergolas and carports to the fascia require much more reinforcing for the structure to remain stable.